German police were carrying out a huge manhunt Saturday for a 22-year-old Syrian suspected of planning a bomb attack, after finding “highly explosive” materials in his apartment. Security has been boosted at Berlin’s two airports and at train stations in the capital. The suspect, Jaber Albakr, could have had “an Islamist motive”, police sources told AFP. German news agency DPA, citing security sources, reported that Albakr had links to the Islamic State (IS) group. Police said “several hundred grams” of an “explosive substance even more dangerous than TNT” were found in Albakr’s apartment in the eastern city of Chemnitz, about 260 kilometres south of Berlin. “Even a small quantity of this substance could have caused enormous damage,” police said. Three people with links to Albakr, who arrived in Germany last year as a refugee, have been arrested in Chemnitz. Heavily-armed officers, some wearing balaclavas, carried out a vast operation in the neighbourhood where Albakr had been living. Around 100 local residents were evacuated from the area, and a loud explosion was heard in the leafy suburb as police forced their way into the apartment with an entry device. Germany has been on edge after suffering two attacks claimed by IS in July — an axe rampage on a train in Wuerzburg that injured five and a suicide bombing in Ansbach that left 15 wounded. Those two attacks rattled Germans’ sense of security and fuelled concerns over the country’s record influx of nearly 900,000 migrants and refugees last year. In Chemnitz, part of the city’s main station was sealed off by officers as a remote-controlled robot was deployed to inspect a suspect package on a platform which turned out to be harmless. Police destroyed the explosives found in the apartment in specially-dug holes on land nearby. Albakr had been under surveillance for some time, with the magazine Focus reporting that he was suspected of plotting to attack an airport. Two of his associates were arrested close to Chemnitz’s railway station while a third was taken into custody in the city centre. A package belonging to one of those arrested was undergoing analysis, police added. “They were known to the suspect we are looking for and were arrested and detained,” said Bernhardt, who added that the trio were being questioned. Albakr was living in a neighbourhood of Chemnitz whose communist-era housing estates are home to many recently arrived refugees. Police in the state of Saxony, where the city is located, issued a search warrant for Albakr after officers received information from domestic intelligence services, a police spokesman said, saying he was born in Syria in January 1994. They added that Albakr was wearing a black hooded sweatshirt and was “suspected of preparing a bomb attack”, issuing an image of the man. “At present we do not know where (the suspect) is or what he is carrying,” police said on Twitter, urging residents to be cautious. German police said previously they had identified 523 people who posed a security threat to the country, around half of whom were known to be currently in Germany. On September 21 German officials said a 16-year-old Syrian refugee had been arrested on suspicion of planning a bomb attack in the name of IS. The youngster, thought to have been radicalised only recently, was detained in a special forces operation at a shelter for asylum seekers in the western city of Cologne, police and prosecutors said. Initial information gathered from the teenager’s mobile phone showed that he had expressed an “unmistakeable willingness” to carry out an attack, Klaus-Stephan Becker of the Cologne police told reporters. A week earlier, German police detained three men with forged Syrian passports accused of being IS militants and labelled a possible “sleeper cell” with links to the assailants behind the November attacks in Paris. 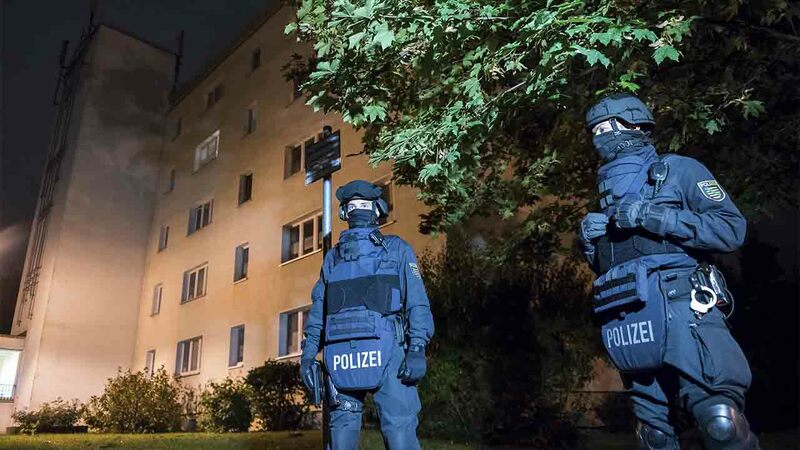 More than 200 police took part in pre-dawn raids in northern Germany to detain the men, suspected of either plotting an attack or awaiting orders to commit one. German authorities have urged the public not to confuse migrants with “terrorists”, but have acknowledged that more jihadists may have entered the country among the nearly one million asylum seekers who arrived last year.